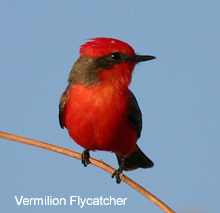 Visit our BirdAZ B-Log for the latest information on birds and birding in southeast Arizona, along with trip highlights, book reviews, and more! Get the Aimophila Adventures widget and many other great free widgets at Widgetbox! Also visit our new guestbook! Aimophila Adventures offers the experience of birding for experts and beginners alike, from precisely targeted searches for the latest tropical rarities to in-depth introductions to the lives and habits of common desert birds. Because we bird on your schedule, we can accommodate trips of any length. We can guide birders visiting the area on business, even those with just a few hours to spare, to surprisingly bird-rich destinations right in the city. Or we can create multi-day itineraries to cover the entire range of Arizona habitats—ensuring an impressive list of the state's many avian specialties. While Aimophila Adventures specializes in birding, we can design your custom itinerary to include visits to Spanish colonial missions, Native American ruins, and other impressive testimonies to the unique cultural history of our region. Aimophila Adventures is a business, but we are first and foremost birders. If you don't want or need a guide, but still have questions that aren't answered in the usual print and online sources, please feel free to call or e-mail us at 520 320-9868 or birding@birdaz.com. We may be able to help, and maybe next time we'll have the pleasure of birding with you as a customer!